Some of the United Nations’ most important contributions to illuminating the links between conflict and environmental degradation are the excellent post-conflict environmental assessments that the UN Environment Programme’s (UNEP) Disasters and Conflicts Programme has carried out in Afghanistan, Lebanon, and Sudan, among other countries. UNEP is currently preparing to conduct an assessment of Rwanda’s environment. 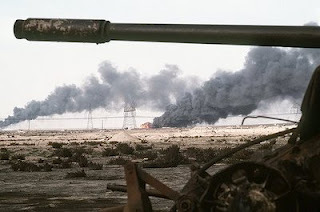 Photo: A Kuwaiti oil field set afire by retreating Iraqi troops burns in the distance beyond an abandoned Iraqi tank following Operation Desert Storm. Courtesy of Flickr user Leitmotiv.